Architect and designer, the 6 of 1920 is born in Milan, his father Enzo Ferrieri attends great intellectuals: Luigi Pirandello, Eugenio Montale and Umberto Saba, is therefore a cultured and sought after environment in which Anna grows. Enzo Ferrieri is also the founder and editor of "Convegno", a magazine of literature, theater and figurative arts of the time that, together with the circle of the same name, became an important meeting point in the Milanese cultural debate..
Anna Castelli Ferrieri becomes famous thanks to her industrial design projects and innovations, especially those related to the revolutionary use of plastic. He collaborates with Kartell, an avant-garde company founded by Giulio Castelli, an engineer in the chemical sector. Anna creates various objects for Kartell since the mid-sixties. His design philosophy was to create innovative and functional objects to be used in everyday life. A theme that today we could consider trivial, but that at the time upset the furnishing sector and not only. It was the 4870 chair designed for Kartell that earned it the first gold compass in the 1987, a chair made entirely of plastic, which had the distinction of being perfectly superimposed with other chairs of the same model. In the 1946 in Milan he founded his architecture studio and began to collaborate actively with the Milan Triennale, which over the years hosted several exhibitions and which awarded it in the 1947 the gold medal for a convertible armchair and a bed for children. His philosophy was inspired by the idea of ​​architecture "for everyone", oriented in this by the rationalism of the Bauhaus school. 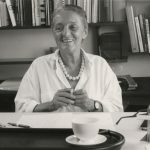 Anna Castelli Ferrieri died in Milan 22 2006 in June, but in the history of design its track is definitely immortal.